On and off, IZ would ask to "play" with a pair of scissors. 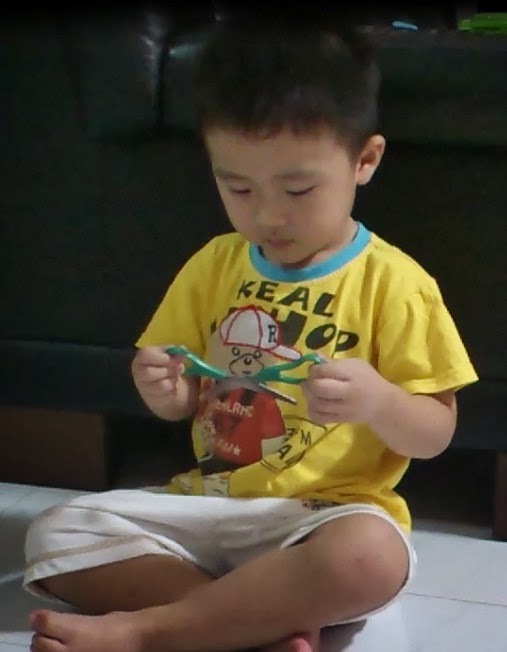 Well, I do let him "play" with them, but I watched him really closely and have been telling him consistently that playing with scissors are dangerous and that he can only use it to cut papers. For months, he has been using both hands to open and close the scissors to cut. He refused guidance, so I would tell him how to cut properly and then let him be. He would ask me to hold the piece of paper or dough strip he wanted to cut and then cut roughly. Just 2 weeks ago, he was still struggling with 2 hands.. this week, he surprised me. He changed to holding it inward. He still refused help. But when my helper corrected him that he should hold it properly, he insisted I taught him this way. This week, he finally got it. I believe he learnt a fair bit in school, it looks easy on him. Cutting it almost properly - well done son! The whole night he played cutting and pasting. 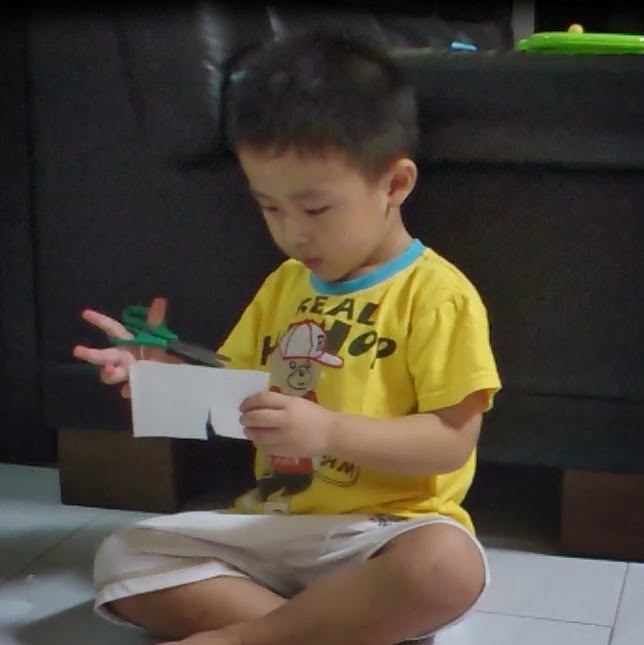 Now, I read the following, that proper scissors cutting is good..
Because, correctly done, it provides the child with lots of practice in using the tripod fingers together – ie the thumb, forefinger and middle finger. Have a look at this pic of a mature pencil grip and you can see how these tripod fingers are working well together to control the pencil. Scissor cutting, with a proper scissor grasp, will give these fingers lots of practice in working together, and will strengthen your child’s hand muscles. 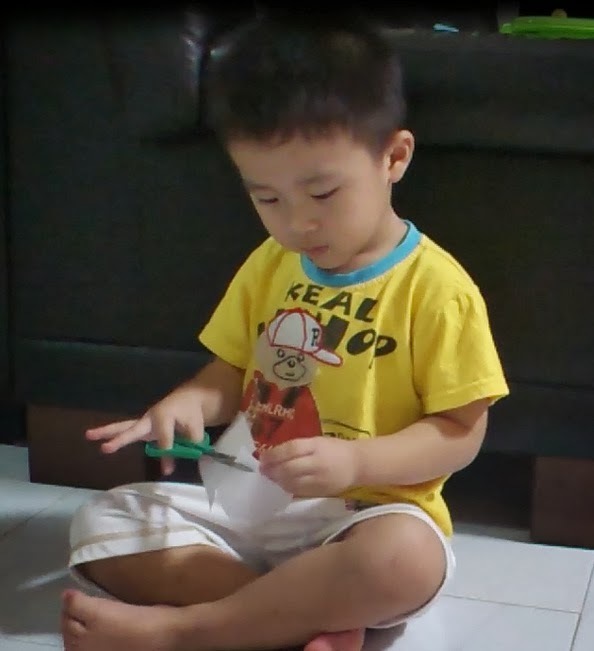 This will help to improve fine motor skills and to develop the correct pencil grasp for good handwriting. I shall wait for the day he's willing to change his pencil grasp.. Meanwhile, I'm going to print some cutting skills print for him to polish his new found skill!